We see it all the time, someone disassembles their beloved classic car with plans of restoring it, only to discover it isn’t as easy or cheap as they thought it was going to be. Fast forward 30 years and their stalled project has deteriorated more than it would have had they just left it alone. 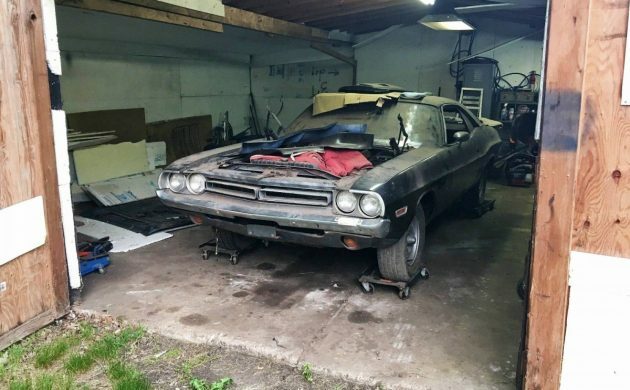 This Challenger made it a bit further than some, with a DIY paint job and a fully rebuilt engine, but it’s still spent the better part of the past 30 years parked in the barn due to rust in the floors. They must have realized they aren’t ever going to finish it, so it’s now up for grabs here on eBay in Westport, Massachusetts. The seller claims they are the second owner and that they’ve had it since 1976. There’s no word on exactly when the paint job was done, but it’s probably safe to assume it was done around the time that it was parked. They note that there are runs in the clear coat, but that painted it in hopes of keeping it from rusting. Speaking of rust, the floors aren’t the worst I’ve ever seen but definitely need work. It would be helpful if they would vacuum up all the dirt and debris for a better look at the issue. It would also be nice to know what interior parts are missing, as they state the interior is 90 to 95 percent complete. So where did the other 5 to 10 percent go? 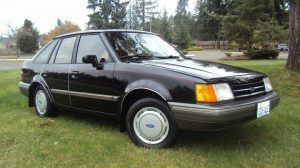 We don’t get a look at the rebuilt and running 318 V8. 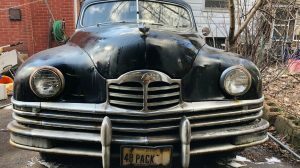 It’s covered in their photos, so it’s current condition is a complete mystery to any potential buyers, but hopefully, the seller can prove that it does in fact run. 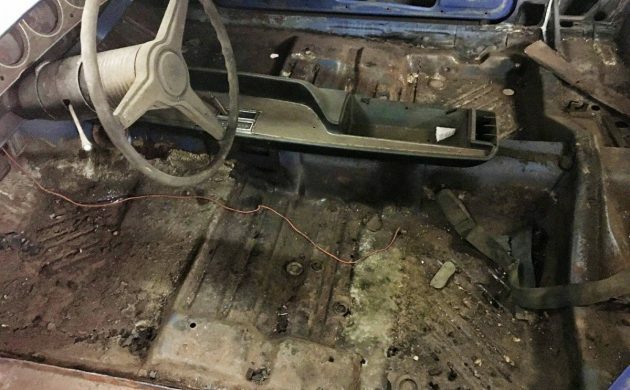 If that really is the case, this car would really only need the floors repaired, the interior put back in and the car cleaned up to be a driver. Making it a top notch show car will likely require a lot more work than that though. Personally, I can live with runs in the paint if the car is fun and safe to drive. The seller’s asking price is way out there given all the unknowns, but they state in their ad that they don’t expect to get that much and are gauging what interest is like at this point. That makes me a bit concerned as to whether they are really motivated to sell it or if they will only be motivated by a big payout. There’s nothing wrong with wanting top dollar for a classic, but you still have to be realistic about what it’s worth. It will be interesting to see what happens with this Mopar though and whether the seller ends up lowering the price. My own project experience (IT, home renovations, cars, etc.) tells me that when somebody says, “90% complete”, it’s actually 50%. That last 10% takes 50% of the total project time; or finding that last 10% of parts costs 50% of the budget. If the rust is limited to the pans, this one looks savable. Best of luck to buyer and seller. Oh H#LL NAW! 11k for another clapped out Mopar? PLEASE!!!!! At first the want was strong. Then she turned around aaaaaaannnndddd not so much. Hey keith, why dont u really telll us what u think of mopars? This trash talking at every mopar listing is getting pretty old. As a former special interest vehicle appraiser and of course still a hobbyist I enjoy everybody’s efforts and the old vehicles. I’d not like to see a novice or even a veteran restorer abandon a project because of one person’s view and negative comment making them feel bbad. After all ate we not brothers and sisters in the hobby?? 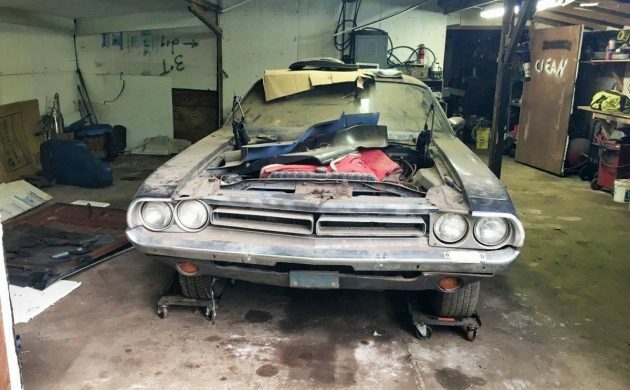 Or, look at it like, if the restoration HAD been completed back then, by now, the car could have been wrecked, rusted even worse, been run into the ground, or made into another hemi clone. Considering all my unfinished projects, I figure this guy and me are doing the future a favor! P.S. Fred, speak for yourself. I haven’t eaten any other hobbyists, but bring me a sweet babe, and I might reconsider! Again I’ll say it to each his own, just enjoy the hobby before us old timers aren’t around. The photo of the hood laying on the floor looks like there may have been a engine fire. 11 grand for a parts car. Mopar guys a different bread, when they sell it’s made of solid gold when they want to buy something it is a worthless item. My brother and I have owned (and sold) 2 Six Pack Super Bees, 1 Six Pack ‘Cuda, a HemiCuda convertible, an AAR ‘Cuda… and many others. I have also had a 1967 Shelby GT500 (I’m in the first SAAC registry ever printed), Tri-Power Corvettes, 442’s, a GTO, 3 Trans-Ams… the list is long. I was a member of the ‘First 500 Club’ (just a concept, not a real club) – because I owned one of the very first Jaguar XK-E’s. Mine was more than 100 cars earlier than Stirling Moss’s. I don’t write this to brag (OK, maybe a little), but to establish the fact that I know from experience what I am writing about, and honestly, to hate on one brand or another is just juvenile. In another BF thread, we discussed exactly why Mopars tend to be strong in the market. To recap – they are the only brand that builds into the serial number the engine with which it came stock. Take THAT GM. It also has a trim tag that (if it is the original), documents virtually EVERY option on the car. POW, big three. Mopar documentation is a relative snap. Nobody can argue (successfully) that Mopars weren’t tough on the street and on the strip/race track. Engine for engine, car for car, Mopars won more than their share of those encounters. That fact alone accounts for a lion’s share of the continued popularity. In their day, though, their prices and corresponding sales were lower than Ford or GM – Chrysler Corp put the ‘3’ in ‘Big 3’. Why? In one word: style. Chrysler spent that largest portion of their efforts on engineering. Style was relegated to Elwood Engle, the man credited for the final look of the 1961- forward Lincoln Continental. His motto at Chrysler was “fill out the rectangle”. The 1964 Mustang lit Ford on fire. 3 years later (after picking up their pants) GM came up with a strong answer in the Camaro. Dodge’s Barracuda debuted at about the same time as the Mustang. There was no comparison. The Mustang ignited an industry. The Barracuda didn’t. It looked awkward and felt like a Dart/Valiant inside. The facelift in 1968 was too little too late. While the 2nd gen Barracuda was MUCH improved in appearance, the interior still lagged behind everything else. It were as though Chrysler only had enough money to improve one aspect at a time (which is more true than not). The Coronet/Belvederes were boxy outside and relatively stark inside, when compared to the corresponding Chevelles, GTO’s, 442’s of the period. People would just rather have style. Simple. We now come to the subject of this article. For 1970, Chrysler finally figured out the pony car. The 3rd gen. ‘Cuda and new-for-1970 Challenger designs were simply gorgeous! From a photographer’s point of view, neither car had a bad angle. 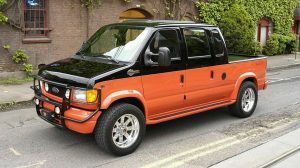 The assortment of stripes, aerodynamic aids, scoops and paint colors were frankly dazzling and were every bit the equal of the best from Ford and GM. Alas; the spectre of a tight budget again reared its ugly head, this time at the worst possible moment. They had squarely hit what they thought could be stretched from a 3-bagger to a home run. Then you close the driver’s door and Ka-Clunk nnnnnggg! Honestly, for the uninitiated, one truly thought that there were broken parts in the door! After that, the stunningly beautiful-appearing interior turns out to be an illusion, too. Everywhere you touch is cheap plastic – not upholstery. Dash, door panels, console. you name it. It contrasted unfavorably with the relatively sumptuous and equally beautiful Mustang / Camaro interiors of that year. Tagged out by the catcher! The standard steering wheel was an 18″ fake wood joke. The power steering lagged far behind the Trans American Competition-developed Mustang, Camaro and (now) Pontiac Trans-Am units. Those cars had excellent road feel. 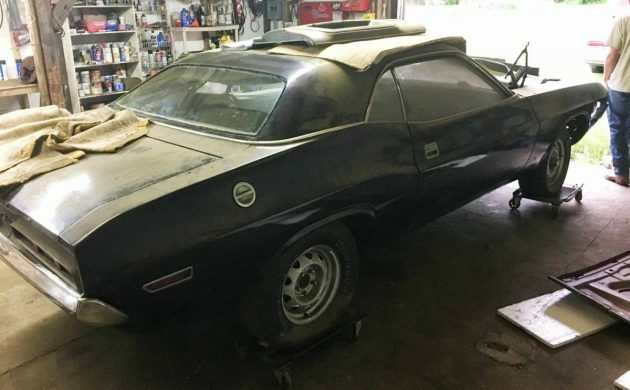 The ‘Cuda/Challenger were so light and numb, that you could have removed the steering wheel and driven it easily (if not safely) with a pair of tweezers on the column nut. Both models had an AAR-T/A (respectively) steering unit available, which was much better, but it was a relatively unknown option, and few ordered it. The same was true for the Tuf-Wheel steering wheel option. Thus went the foundation for the collectible Mopars of the present. The car at hand is a relatively option-less, unremarkable, garden variety Challenger. Restored as it was when born, it will be a beautiful, utterly unappealing museum piece. This car cries out for pro-streeting. Clean up the rust, leave the interior alone (other than a pair of lightweight buckets, harnesses and roll bar), paint it, drop in ANY of the myriad ultra-strong Mopar engines available, built 727 TorqueFlite (or convert to a manual transmission), change the rear to a Dana 60 (most of these parts are off the shelf), cut some tubs for the M&H DOT wrinklewalls and go humiliate a fine Ford or GM product. You will look good doing it. TriPowerVette, excellent and informative comments as usual. @PAPERBKWRITER – good to read that you are still around, too. P.S. 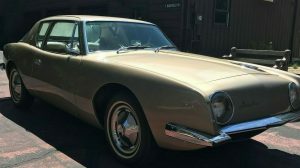 – I just noted that I wote that the Barracuda facelift occurred in 1968, when if fact, it was in 1967 that the revised or 2nd gen Barracuda premiered. Sorry, people. Hire an editor to get your point across sooner. These are comments, not blogs. How did you guys sell a 6 pack Cuda? It should have been another war then because that’s the only way they came with a 6 pack. Mopar is not the only brand to have an engine code in the VIN. Ford products, at least in the 1960s and 1970s all have an engine code in the VIN. They also have a door data plate (up to 1969) or a sticker (starting in 1970) that had more information about how the car was originally equipped. @CATHOUSE – I stand corrected. If you will re-read my comment, I was mostly thinking of GM when I wrote it. But, I did write ONLY. You caught me in a senior moment. Thank you. Thumbs up. TPV….all good points….pretty sure the second gen 70 1/2 up GM ponies had the same doors…..
@Stillrunners – Thank you. I’m not sure what you mean. I have had 1970, 1973 and 1974 Trans-AMs. Their doors were typical GM. Closing one was sufficiently sturdy feeling and sounding. They weren’t Mercedes’ by any stretch, but they were adequately finished. The seller doesn’t really think he’ll get 11 thousand dollars for it, he admits that in the ad. It’s only worth what someone is willing to pay for it, being a lower performance secretary’s car, or a sporty looking car for the guy who couldn’t afford insurance for the Challenger he really wanted. Not everybody wanted an edgy hairy chested speed machine back then either, contrary to what some people think or believe. There wasn’t a single bad angle on that automobile from the outside ! How’s that go, Plymouth makes it, Mopar takes it ?? In closing, I just remember how funny the starters sounded compaired to my 67 Chevelle, 67 Camaro or 72 Rally Nova. @Bill B – I saw VP in the theater more than once, and bought a bootleg foreign copy VHS – long before the studio finally released it for home theater. Also; even though the Mopar starters definitely have their own sound, Ford runs a close second place. Having driven Mopars from the 50’s to 2009 in all performance levels I personally think that they afar ahead of GM and Ford. Granted, suspensions needed tweaking but once done they would blow by any comparable GM or Ford. From the late 60’s to date their styling, handling and power have far surpassed the competition. Thru the years I have blown off many Gm’s and Fords including a few blue light specials. I still drive a ’71 SuperBee that has never been passed when challenged. When I die I’m taking it with me. More power to you, Roger. Considering all your points, please explain why ChryCo came near filing bankruptcy three times in the last fifty years. You must of races some pretty crappy fords and chevys then, or else your delusional.